In previous posts, (parts 1, 2 & 3), we’ve looked at ‘GROSE’ graves & memorials at the Parish Church of Saint Gwinear in Cornwall. 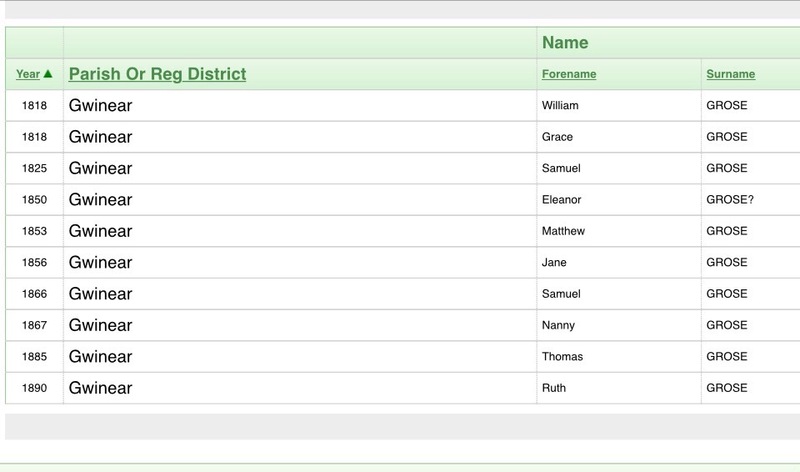 How do these compare with all ‘GROSE’ burials recorded in Gwinear, listed on the Cornwall OPC Database? Is anyone else related to Matthew Grose (1788-1849) who migrated to the Isle of Man? William Grose and Grace Grose are siblings both buried in 1818. Their grave is posted about here. They are the younger siblings of John Grose ‘the Perranuthnoe grocer’ and Matthew Grose ‘who migrated to Foxdale, Isle of Man’. Samuel Grose buried 1825 and Eleanor Grose (nee Giddy) buried 1850, are the parents of ‘the famous engineer’ Samuel Grose. No photo of their grave yet. Can you help? Matthew Grose buried 1853 is the younger brother of ‘the famous engineer’ Samuel Grose. No photo of Matthew’s grave yet. Can you help? Jane Grose (nee Jennings) buried 1856 is the wife of John Grose ‘the Perranuthnoe grocer’ (younger brother of Matthew Grose ‘who migrated to Foxdale, Isle of Man’). Her grave is posted about here. Samuel Grose (buried 1866) is ‘the famous engineer’and Nanny Grose (buried 1867), is Ann (nee Vivian), his wife. Their grave is posted about here. Thomas Grose, buried 1885, not yet researched. Can you help? Ruth Grose, buried 1890, not yet researched. Can you help? From the ten individuals buried in Gwinear, graves for half of them have been located, photographed, identified and discussed. Eight of the individuals listed, (plus others, not buried, but on memorials) are related to our adventurous ancestor, Matthew Grose (1788-1849) who migrated to Foxdale, Isle of Man. The final two, Ruth and Thomas Grose, might be related too, but they’re to be researched another day! Next stop, back to the Isle of Man! !